Open mix crews from Keahiakahoe and Outrigger Canoe Clubs rode the surf at Waikiki during the 66th annual Walter J. Macfarlane Memorial Canoe Regatta yesterday. When it was all over, several more perpetual trophies bore the plaques of Lanikai Canoe Club. The warriors from the Windward side gave no quarter at yesterday's 66th Walter J. Macfarlane Memorial Canoe Regatta at Waikiki Beach, winning 15 of 39 events in steamrolling the opposition and amassing a winning total of 126 points in the traditional Oahu Hawaiian Canoe Racing Association event. 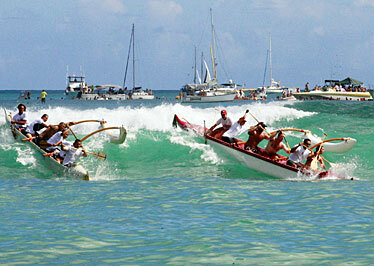 Runner-up and host Outrigger Canoe Club posted 81 points in the AAA (largest-size) division, with Kailua third at 65. Hui Lanakila, which had dominated the prestigious men and women's senior events for the past two years, couldn't keep its streaks going but still managed to win the AA (middle-size) class with 16 points over the 14 points of New Hope and Leeward Kai. Kai Oni took the A (smallest) class with eight points over Anuenue and Waikiki Surf Club (six points each). The Kamaaina Hui perpetual trophy was presented for the first time since 1955 and introduced to yesterday's junior men's winner, Lanikai. It was brought out in celebration of the 100th-year anniversaries of both Outrigger and Hui Nalu. 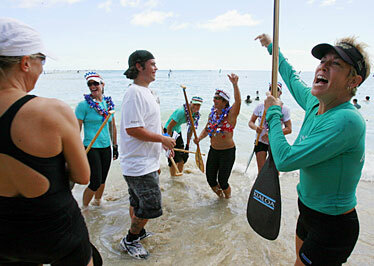 Members of Lanikai Canoe Club's women 40 crew celebrated yesterday's win at the Walter J. Macfarlane Regatta. Tom Conner and Lanikai Canoe Club figured out a way to have fun on the Fourth of July, yet have their full range of novices to veterans gain some surf paddling practice in the process. Conner, the club's head coach in his first year, had Lanikai's six Molokai Hoe open-water veterans alternate as steersman in the 39 events yesterday at the 66th Walter J. Macfarlane Canoe Regatta at Waikiki Beach, regardless of their regular positions in a canoe. As a result, Lanikai dominated the only surf race on the Oahu Hawaiian Canoe Racing Association schedule, taking an eye-popping 15 events and accruing 126 points over runner-up and host Outrigger Canoe Club (81) for their second straight Macfarlane win. Kailua Canoe Club came in third with 65. "We're putting everybody in, throwing everything but the kitchen sink in there today," Conner said. "It's a fun race, and everyone gets a chance to race. The only criteria that I had going in was that we're going to put all our best guys in the back of the canoes (because open steersmen were allowed). We have all our Molokai veterans steering. That's the only edge that we have. Otherwise, we're putting everybody in to have fun." It proved to be more than enough, as Lanikai powered to wins in nine of the first 18 races - the youth and novice events. The results didn't count toward standings for Hawaiian Canoe Racing Association state consideration, but the day helped serve as a tune-up for next weekend's final OHCRA regular-season regatta and association championship later this month. Wave conditions intensified from gentle to challenging as the day went along, but the shouts of support from hundreds on the 15-yard patch of sand behind the Moana Surfrider and Royal Hawaiian hotels were constant. A good-natured mixed surf relay race, won by Kailua, capped the afternoon before numerous perpetual trophies were awarded. And yes, champagne was once again sipped from them by the winners of the prestigious men's and women's senior events. Outrigger ended a 17-year drought by winning the senior men's event for the first time since 1991, beating out Kailua and powerhouse Lanikai with a time of 10 minutes, 30.56 seconds. Doing it on the club's 100-year anniversary at its host event was even sweeter for steersman Jimmy Austin, who was an 11-year-old neophyte with the club the last time Outrigger won the Walter Macfarlane Memorial Trophy in the senior event. "Oh man, it means a lot," Austin said. "We've been trying for so many years here, and it makes it that much sweeter that we lost a lot of our top paddlers this year. And Lanikai this year has just been phenomenal, winning every race by 35, 40 seconds. To finally win one, just that race, it means so much to us." Outrigger men's coach John Puakea thought his team did just enough heading out to the flag, then caught the right amount of waves on its way in. He added that their Diamond Head-facing lane assignment unquestionably helped, but it was a special win because of the youth of his crew; Austin, 28, is oldest, and three new crew members this year - Simeon Ke-Paloma and Craig and Scott Gamble - replaced departed veterans. Lanikai's senior women team captured the other blue-ribbon event - and the senior women's bowl - for the first time since 2003, with the help of steersman Jim Foti. Ann Dewey, sitting at No. 2, and Lisa Sauer, at 5, were grateful for the help of Foti and the other veteran steersman who assisted numerous crews. "They've all done very well, and they've been enthusiastic about it," Sauer said. Foti was just happy to be in on a senior win. "It's real special," Foti said. "I'll slip in on that champagne any way I can get it, I suppose." Hui Lanakila had a three-year streak in the Macfarlane senior men race snapped, and two-year streak in the senior women broken. But the club captured the AA division (middle-size) with 16 points, while Kai Oni took the A class (smallest) with eight points.